Nissan has called its Maxima sedan a four-door sports car since 1989, which marked the debut of the third-generation Maxima—a legitimately athletic V-6-powered saloon that even offered a limited-slip differential to mitigate its front-wheel-drive cornering foibles. That Maxima memorably wore a “4DSCâ€ decal to drive the point home, and the next couple generations carried on the tradition well enough, though there were some cost-cutting measures under the skin. But when the cheaper Altima gained a healthy V-6 of its own in the early 2000s, with the Accord and Camry soon to follow suit, the Maxima had an identity crisis on its hands. Could the four-door sports car stay relevant in the age of the steroidal family sedan? Well, we’ve been itching to find out, so we put 2012 Nissan Maxima SV through its paces. Ours had the Premium package, mind you, so it lacked the Sport’s performance-oriented suspension upgrades and 19-inch wheels. But that 4DSC DNA supposedly comes standard in every Maxima, so we approached our SV Premium with that in mind—and drew some surprising conclusions. The Maxima’s driving position passes the tall-guy test with flying colors. The steering is unusually precise and responsive, and body roll is well controlled. There’s a solid shove from the 290-horsepower V-6 once the continuously variable transmission (CVT) wakes up. Inside, the Maxima boasts mostly high-quality materials and one of the most intuitive infotainment interfaces in the business. Even without the Sport model’s aggressive wheels and tires, the Maxima’s ride is on the stiff side of firm. The lackadaisical CVT feels incongruous in a would-be sport sedan. The backseat is surprisingly tight given the car’s substantial footprint. Moreover, the V-6-powered Altima, which rides on the same platform, provides comparable performance and a more nimble feel for less coin. “Big.â€ That’s the Maxima driving experience in one word. Between its thick front end, chunky dashboard, and elevated seats, the Maxima does a pretty mean impression of another platform-mate: the Murano crossover SUV. In traffic, you’ll notice that you’re looking down on most other sedans. If the pavement’s patchy, you’ll also notice that the even the SV-spec suspension and 18-inch wheels—the softest tandem available—transmit some unseemly impact harshness to your (elevated) backside. 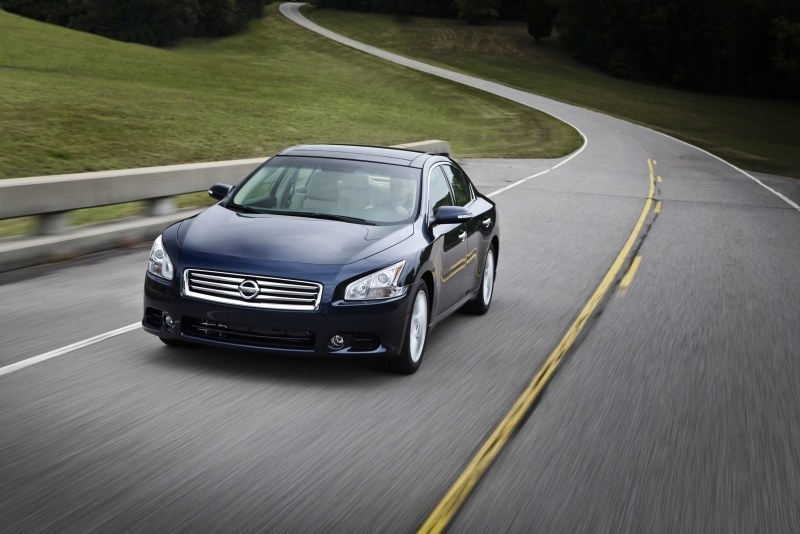 And on the highway, the Maxima’s tightly wound steering requires a committed hand and frequent corrections. Should you venture onto a twisting two-lane, the Maxima’s stock will likely rise, as it’s clear that steering precision and body control were engineering priorities. In other words, yeah, there’s a modest 4DSC vibe here. The car’s substantial bulk is unwelcome in tight corners, however, as is the open differential (the limited-slip was discontinued years ago), which reliably smokes the inside front tire if you’re generous with the throttle. 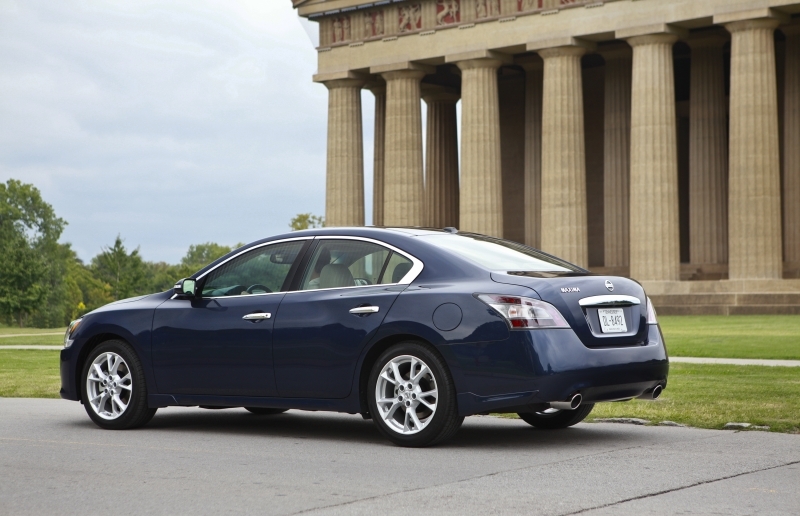 Every Maxima is powered by a 3.5-liter V-6 rated at 290 horsepower and 261 pound-feet of torque. The continuously variable transmission (CVT) is mandatory as well. Maximas were long known for their silky V-6s, but that was back in the 3.0-liter days; this 3.5-liter piece has a gruffer voice. It certainly hauls the mail, though—and produces the same distinctive “motorboat squatâ€ during acceleration as the Altima’s V-6. In an attempt to make the gearless CVT feel more like a conventional automatic, Nissan has programmed it to build gradually toward the engine’s power peak rather than just zinging straight to the sweet spot. This blunts the transmission’s responsiveness, making the Maxima feel a step slow when urgent acceleration is called for, especially off the line. Happily, the standard GT-R-style manual shift paddles largely rectify this with their simulated discrete gear ratios. The EPA rates the Maxima at 19 miles per gallon in urban driving, 26 mpg on the highway, and 22 mpg combined. That’s not bad for a big V-6, but you can certainly do better elsewhere if fuel economy is a priority. The cheaper Toyota Camry SE V6, for example, delivers 21/30/25 while easily matching the Maxima’s urge. The SV is the top-of-the-line trim level, so it comes with a bunch of neat stuff right out of the box—as well it should for a base price of $34,450. Highlights include dual-zone automatic climate control, Bose audio with twin subwoofers (and, as per usual for Bose’s automotive efforts, underwhelming sound quality), push-button ignition, leather upholstery, and a sunroof. Unfortunately, the rest of the neat stuff costs extra. Tack on the desirable Premium and Technology packages, and you’re looking at our test car’s gulp-inducing $40,930 msrp. To be fair, the extra six or seven grand gets you—among numerous other niceties—HID headlights, a dual-panel moonroof, the abovementioned paddle shifters, iPod/USB connectivity (which should be standard by now), and Nissan/Infiniti’s excellent infotainment system, which bundles a hard-drive-based navigation system with one of the most intuitive interfaces on the market. 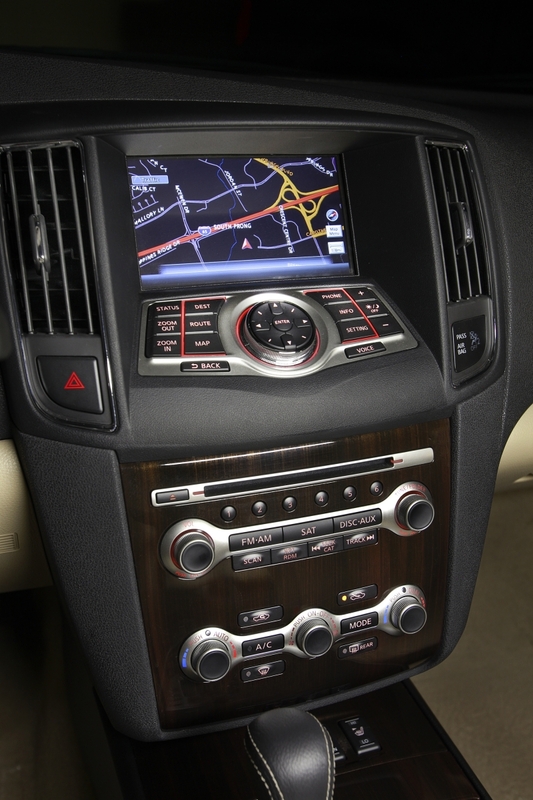 Never mind that the claimed seven-inch display screen is closer to six; the only real issue here is that the dashboard-based controls are an uncomfortable reach for lanky drivers, leaving us with a new appreciation for console-mounted control knobs (see the Hyundai Genesis or Mercedes-Benz C-Class). Despite the Premium package’s upgraded leather and exclusive wood-tone trim, we didn’t find our Maxima’s interior quite worthy of the car’s lofty price tag. Sure, you can do worse, but our maxed-out Maxima competes with the likes of the aforementioned Genesis and C-Class, not to mention the redesigned BMW 3 Series and Nissan’s own Infiniti G37. And the plunging roofline and high middle seat limit real-world rear capacity to two medium-plus-sized adults. Let’s be clear: the Maxima’s interior is quite nice on its own merits, featuring soft-touch panels for the dash and doors as well as a generally high-quality ambiance. It’s a step up from the Altima’s pleasant interior, so in that sense it does its job. We’re just not sold on it as a luxury-car cabin. When the Maxima debuted a few years back, its jagged headlights sparked much debate among, well, geeks like us who debate such things. Time hasn’t fully healed those wounds, but we’ll grudgingly award Nissan a few points for originality. The most striking stylistic element here is the rear fenders, which curve out from the greenhouse to form Porsche-style “hips.â€ Also worth noting is the voluptuous hood, which unceremoniously terminates at the apparently Mack-truck-inspired upright grille. Let’s start with the obvious: the Maxima’s hard to love at over $40,000. 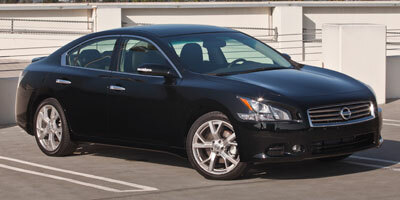 But as a bigger, nicer Altima, the base Maxima S has real appeal in its low-$30s comfort zone. Try the Altima V6, of course, and also take a look at the new Camry SE V6 and Volkswagen Passat V6. We’d throw the rear-drive Chrysler 300 and Hyundai Genesis into the mix as well. Capable cars all, but at the S model’s lower price point, the Maxima’s got a fighting chance. Nissan has a great commercial in which a 370Z driver learns he’s a father-to-be and trades his Z on a new Maxima—the four-door sports car. But in truth, Nissan already has one of the sportiest family sedans on the market in the Altima V6, and the Maxima is just a larger, slightly more luxurious variant. Not that there’s anything wrong with that; on the contrary, the Maxima is undeniably an all-around nice car. Just keep an eye on the price, as there are some real four-door sports cars available from the mid-$30s on up.